← Over 1700 Signatures to the Mayor! We’ve been following the use of hazardous herbicides by the Natural Areas Program (NAP) for some years now – and it’s been rising steadily. We recently compiled the data for 2014. For the first time since 2009, 2010, NAP’s use of Tier I and Tier II herbicides actually declined. 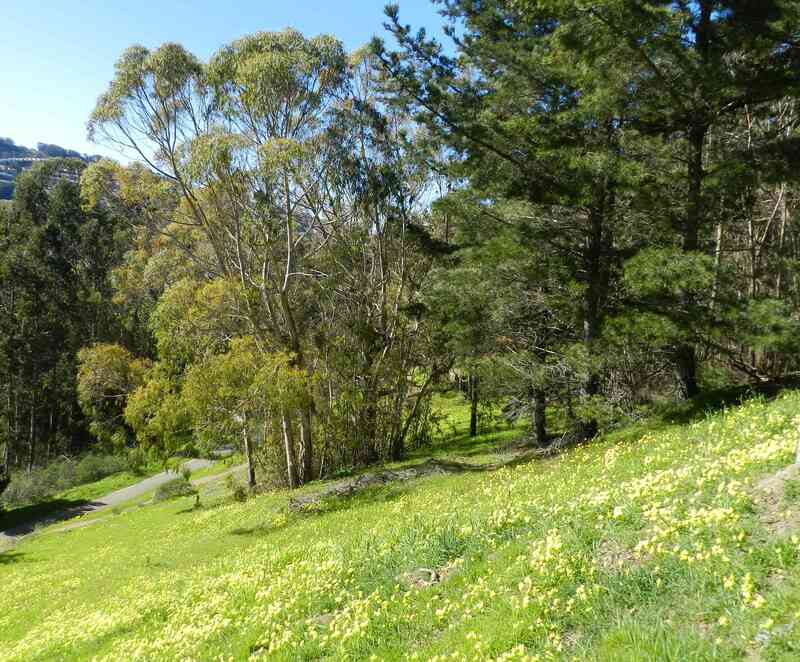 (San Francisco’s Department of the Environment – SFDOE – sorts acceptable herbicides into three tiers. 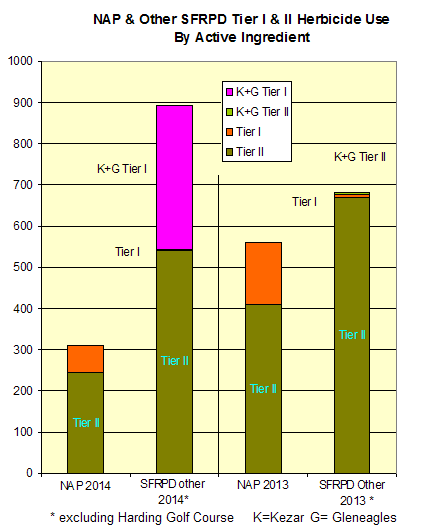 Tier III is Least Hazardous; Tier II, More Hazardous; and Tier I, Most Hazardous.) It’s even below 2010 levels, though considerably higher than 2009. We consider this an encouraging development. Garlon is Tier I, and the other three are Tier II. NAP uses no Tier III herbicides. 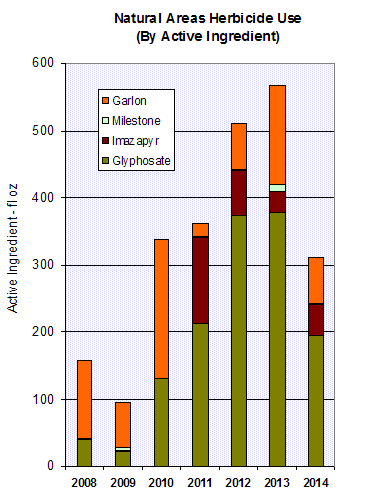 All these herbicides have downsides, but Garlon is the most problematic. SFDOE considers it a ‘high priority to find an alternative.’ Why? Risk to animals – dogs may be especially sensitive to Garlon because their kidneys take longer to process the chemical. Persistence – it can remain in the soil for years. The Natural Areas program is still the largest user of Tier I herbicides in the SFRPD, (with one exception we’ll discuss below). It’s mainly Garlon used on oxalis, the yellow-flowering plant that covers San Francisco hillsides in spring, and which they consider an invasive non-native plant (together with about 35 species of plants, including fennel). Oxalis flowers early and spectacularly in Spring, providing abundant nectar to bees, butterflies and other insects. It then dies back, making way for other plants. In any case, knocking back the oxalis merely opens the niche to the next most adapted plant, most likely also non-native, to expand into the vacated area. The first graphs showed a comparison based in the volume of the active ingredient, which is the metric the Department of the Environment prefers. 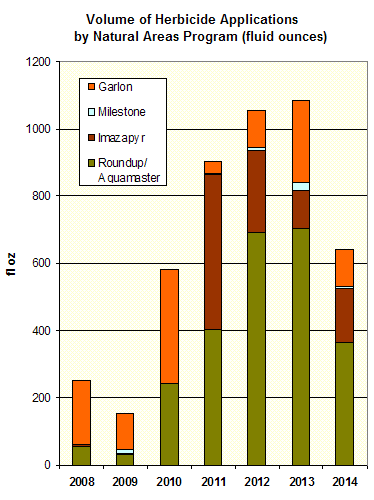 This second graph show NAP’s herbicide use in terms of number of applications (which is a proxy measure of breadth of exposure to the herbicides). The number of applications in 2014 rose slightly from 2013, but not close to the 7-year high in 2012. 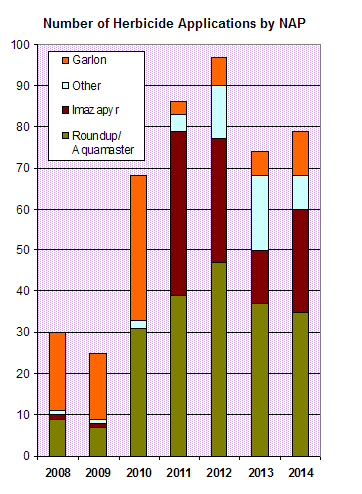 The third graph shows the volume of herbicides used (which includes both the active ingredient and the so-called ‘inert’ compounds that are not always in fact inert). Here too NAP has reduced its usage in 2014. By this measure, NAP still hasn’t dropped back to 2010 levels, mainly reflecting the changed product mix with less Garlon in 2014. A mistake in Gleneagles. In March 2014, Gleneagles golf course used a huge amount of triclopyr (512 fl ounces), while its normal usage is little or nothing. In fact, except for NAP, triclopyr is little used by SFRPD. Gleneagles also used 36 fl oz of Sapphire, a golf-specific product that is supposed only to be used when getting ready for a tournament. At the annual pesticide review meeting, SFRPD’s Integrated Pest Management Coordinator confirmed that it was a mistake by an outside contractor. Kezar Stadium soccer field’s new herbicide. Kezar Stadium used Drive XLR8 (quinclorac) on the soccer field in November and December 2014. This required an exception, because it’s not approved for use on city-owned property. The stadium was closed for three months, so SFDoE considered the risk acceptable. We wondered why, if the stadium was closed, they could not just plow the thing under and start anew, but apparently that would be a capital budget issue. We hope these kinds of questions do get asked somewhere in SFRPD. Coincidentally, Golden Gate Audubon reported a number of dead birds showing up in the area, but Drive XLR8 is not considered especially toxic to birds and there’s no indication the two things are related. [Edited to Add: Actually, they may be related. See section at the end.] Anyway, Chris Geiger of SFDOE confirmed Drive XLR8 was a Tier I pesticide that would not be moved on to the approved list; this usage was a one-off. Adjusted for the two incidents above, SFRPD reduced its non-NAP herbicide use by about 20% from 2013 to 2014. In fact, its usage this year was below NAP’s herbicide usage for 2013, and it used only a tiny amount of Tier I herbicide. But for exceptional incidents like the ones described about, NAP remains the single largest user of Tier I herbicides in SFRPD. We applaud NAP’s reduction of herbicide use in 2014, and call for it to eliminate use of all Tier I and Tier II herbicides. As we mentioned above, there were reports of dead birds around Kezar Stadium. We learned that they were mostly robins (but Golden Gate Audubon also mentioned blackbirds and sparrows), and the person who found them spotted several dead birds where ordinarily even one is unusual. We assumed that the use of Drive XLR8 on the Kezar Stadium turf was unrelated, because our research indicated no especial threat to birds. Robins love digging in the grass for worms and such, and with the stadium closed they would have had undisturbed access. If the worms on the field were poisoned by ethylene glycol, so would the robins. There’s no way to tell for sure, because as far as we know none of the dead birds was kept for a necropsy (like an autopsy for animals). But anyway, the good news is that the Department of the Environment does not plan to use this product again. This is good news. Thanks for closely monitoring herbicide use by Rec & Park and its Natural Areas Program. Surely your vigilance is an important factor in their reduced use. They know you are watching and reporting on what they are doing. Thank you!! Thank you for educating people on the different tiers of herbicides and their toxic effects, and for monitoring the use of herbicides in San Francisco. The information you’ve provided will also be useful when working in my own yard. Of course, it’s only a matter of time before superbugs develop as they become used to these herbicides.